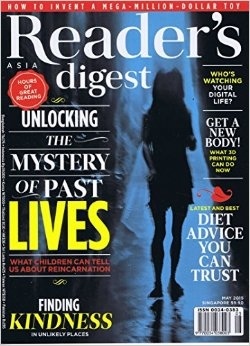 In the May edition (Asia) of Reader’s Digest, the topic of reincarnation is displayed on its cover prominently. The interesting article within that issue, features 3 stories of present children recalling their past lives. One of them is only approximately two years old! At such a tender age, it’s quite difficult to comprehend that the child conjured such ‘fictional memory’ for the parents’ consumption. Though I personally cannot vouch for the accuracy of the said stories, I don’t discount them as false either. In my healing practice, a few of my clients have actually claimed to get visual flashes of scenes from their past lives during our reiki sessions. When they awaken, they understand how their past encounters have a bearing on their present lives, including their physical condition, fear/phobia and behaviors. As I have also met children whom have claimed to remember fragments of their past, I don’t doubt that our souls make more than one trip back to Earth as physical human beings. A very famous channeler of messages from the Other Side (Kryon) by the name of Mr. Lee Carroll (who has channelled for the United Nations several times before), has already prompted the masses years ago, to look for future cases of children remembering their past lives. It has been explained, that as human consciousness shifts further on this planet, our multi-dimensional DNA field of energy will ‘communicate’ more efficiently with our conscious self, giving us clues to who we really are. Information such as past life memories within our quantum DNA field will ‘seep through’ more easily than decades ago. According to Lee Carroll and other gifted channelers/mediums, quantum science will in the future, reveal more about our true nature and our entangled state with the energy grids on the planet and our link to the Universe. The indigenous of many countries have opined that our lineage goes way back to the stars. Lee Carroll’s messages also indicated that there will come a time, when traces of DNAs are found on other planets as well. Interestingly, a proportion of past life regression cases of the late Dolores Cannon (therapist & author) even have people describing themselves living on other planets before. Times have indeed changed….and so have our belief systems. As humans continue to think outside the box and push the boundaries of belief, I strongly feel that more enlightening discoveries will be made in the future. Disciple : What is the greatest threat to humanity? Disciple : .. And the salvation of humanity lies with whom? Disciple : What’s the difference then, Master? Master : Choice of the humans. An illumination can still be found.. But not from the external environment. – author and medium, Sylvia Browne.